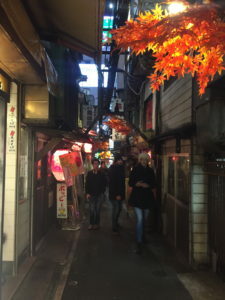 Stepping out into the evening, the first thing you notice in Shinjuku are the colours. 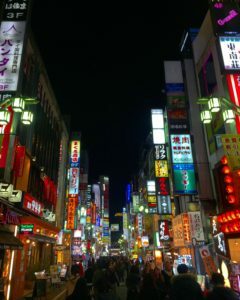 Long after the sun has set is when the city of Tokyo truly comes to life; bright neon signs light up the hordes of people walking through the streets, and the exotic smells of Japanese food assault your senses as you wander aimlessly, mesmerised by the crazy world around you. It’s no secret that Tokyo, Japan, is one of my favourite cities in the entire world. 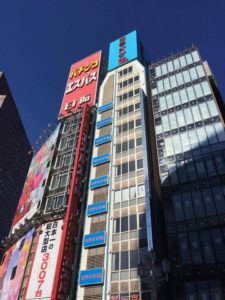 Full of buzzing energy, the Shinjuku district is one of the most incredibly ridiculous places I have ever visited, and is also the setting for another of my favourite travel experiences – Karaoke in Tokyo. In Japan, karaoke is a huge part of the culture. From closing a deal with a business associate to bonding with your family, karaoke is sung loud and proud across the many karaoke bars that litter the city of Tokyo. Most of these karaoke bars offer private rooms, some complete with mini-stages and spotlights, and a waiter is on hand to serve you with enough liquid courage to take on any song. As we all know, the point of karaoke is not to impress others with your singing (thank god), but to liven the mood and create a fun, enjoyable atmosphere, regardless of whether you have a good voice or not. According to Karaoke Scene, the Japanese are generous when listening to others sing, and aren’t shy when handed the microphone; which is likely one of the reasons that karaoke has been so largely accepted in Japanese society, and is so common in Tokyo. In February of this year, much to my delight, I found myself in Japan yet again, this time with six of my mates – Scott, Carlee, Jordan, Dengate, Jono & Hannah. We’d decided to head out into crazy Tokyo, and find the best karaoke bar in the city. We began the night in our tiny Airbnb apartment in Shinjuku, only minutes by foot from the colourful centre of the district. Deciding that the night needed to begin on the right foot, we headed downstairs to the Family Mart located just below our building, and we returned to our room loaded with an absurd number of chuhai cans (if you don’t know what chuhai is, I recommended reading this first), and began to plan our assault on Shinjuku. The first point of call was the infamous ‘Piss Alley’. Despite its charming name, Piss Alley is one of the coolest places in Tokyo. Relatively unknown to tourists, the cramped alley is full of tiny bars and restaurants, some so small they only fit several people at a time. A local hotspot in the city, many of the places in Piss Alley won’t even allow foreigners (or gaijins) in, so don’t take it personally if you try to get a seat in a seemingly empty bar and you are told that it is full. The infamous Piss Alley during an unusually quiet moment. Piss Alley got its name quite literally, as the area used to be a bit of a dive for dodgy locals to get drunk. Given the small space and lack of toilets, people used to answer nature’s call wherever they pleased – hence the name. Charming, right? But charming is exactly what Piss Alley is, and if you can manage to get a table in one of the teeny bars or restuarants, you’ll see why. Our group, despite being seven people strong, managed to get the only table in one of the slightly larger restaurants. It wasn’t exactly comfortable, but we all managed to squeeze in and peruse the strange menu for a tasty treat before hitting up the karaoke bar. Being a vegetarian, there was little on the menu that appealed to my taste buds (although even if I wasn’t, I doubt I would have had the stomach to try the raw horse meat). It’s hard to describe the atmosphere in Piss Alley. It’s so cramped and busy, but it is absolutely bursting at the seams with culture, life and joy. I can’t think of a single place like it anywhere in Australia, or anywhere else I’ve visited in the world. Being granted access to one of the little restaurants was a real treat, especially considering that many Westerners are turned away. After some odd food, a couple of beers and a few sake shots, we were ready to leave Piss Alley and find the best karaoke bar that our yen could buy. We scoured the streets of Shinjuku for about half an hour before stumbling upon the karaoke bar of our dreams. With the sake shots running hot through our bloodstream, we confidently bartered with Yuki, the very tolerant and very friendly cashier at the karaoke house. 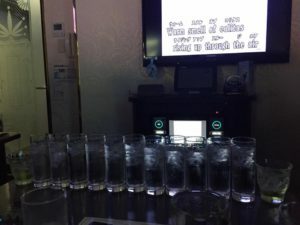 We eventually agreed to 3,700 yen per person for a two-hour session (roughly $45 a head), which included unlimited karaoke in a private room, plus unlimited drinks. Yes, unlimited drinks. We were taken up several stories in the elevator before being shown our incredible room for the evening’s festivities. A small platform with a gold microphone stand graced the corner of the room, and the large window adorned an unbelievable view over the bright lights of Shinjuku. We immediately ordered 7 beers, one each, before starting to sing. This would prove to be the only modest drink order of the evening. Best karaoke establishment in Shinjuku! Now, I love a good power ballad. My voice may not be the greatest, but boy do I love belting out a tune. Maybe it was the sake, or the beer, or the chuhai from earlier, but for some unknown reason I thought it was a good idea to kick off the karaoke night with ‘Hello’ by Adele. If you’ve got me on SnapChat, you may have even seen me rocking this song in the comfort of my bedroom, but on this night, it was a genuine disaster. The mood, which was quite elevated thanks to our combination of alcoholic beverages, immediately sunk as my melancholy, out-of-tune voice absolutely destroyed the hit song. When it was finally over, everyone demanded I return to my seat, and I graciously complied. Note to self – Adele is NOT a party starter, no matter how much sake, beer or chuhai you’ve consumed. Carlee was next, and she’d chosen to rap ‘Monster’ – a Kanye/Jay Z masterpiece. As much as I love Carlee, her rapping skills left much to be desired after the amount she’d already had to drink, and she sunk pretty fast. Noticing a second microphone, I grabbed it and joined her, saving her from the sure embarrassment of rapping out of time in front of the six other people in the room. I’m such a good friend. Luckily, my rapping skills are far better than my actual singing, so we rapped the rest of the song triumphantly together, and I redeemed myself from my previous poor song choice. As we all took turns performing the classics, we also took turns ordering drinks for the room. If you’ve never been to karaoke in Tokyo, the way to order drinks is through a telephone on the wall. You pick it up, press a button and you’re connected to your waiter. You tell him your drink order, then he brings the drinks up. Pretty simple, right? Just a casual amount of drinks for 7 people. And you know what? He did exactly that. We had so many different drinks that at one stage, I was drinking five cocktails at once, taking a sip from each as I went around in a circle. This is the part of the night that gets a bit fuzzy; Dengate trying to dance and sing from atop the tiny tables, but was hindered from doing so due to the lack of table top real estate, and singing together so loudly that no-one could actually hear what song we were belting out. Eventually, Yuki came back upstairs and told us that our time was up, and we had to leave. Adamantly standing our ground and refusing to vacate this wonderful slice of heaven, Hannah managed to convince him to let us stay for another hour, where we continued drinking, singing, drinking, stumbling, singing and drinking until it truly was time to leave. Before all-you-can-drink karaoke destroyed us all. Wandering through busy Shinjuku in the early hours of the morning after all-you-can-drink karaoke had destroyed us all, we managed to find a McDonalds – a mighty feat given our level of inebriation. After devouring enough cheap Japanese Maccas to feed a small nation, it was time to head back to our apartment. As we left the building, we noticed it had begun to snow, albeit lightly. Carlee, who was overcome with emotion at the first sight of snow, began to cry with joy. Dengate, who was overcome with alcohol, had passed out in the gutter and refused to move, despite becoming a real-life snowman. Eventually, we hustled the semi-conscious Dengate and the teary Carlee back to our tiny Airbnb apartment to pass out. Waking up after our night out at karaoke in Tokyo, to say we were ruined would be an understatement. Hungover as could be, we forced ourselves out of bed to the nearest ramen house, and stuffed ourselves so full of the delicious noodles that we forgot we were hungover at all. There’s something about Japan – you wake up feeling hungover, but once you step out into the crisp, fresh air, it’s like you’re magically cured. Wow! Sounds like you had a great time in Tokyo! 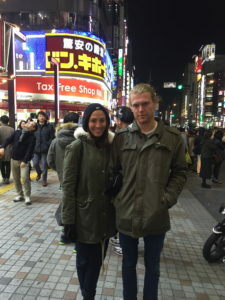 Tokyo has always been on our bucket list, we were going in 2011 but the Tsunami put an end to that. Great story can wait to visit. Karaoke is pretty much a right of passage in Tokyo. It always shocks me how Japanese people (and natives of other Karaoke-crazy countries throughout Asia) can sing in front of complete strangers without any kind of Dutch courage. Good to see you required the see the same fortification however I can’t say the same about Tokyo curing hangovers. Those I experienced in the city seemed to be particularly persistent! Oh gosh. All-you-can-drink karaoke sounds dangerous! It sounds similar to the KTV karaoke here in China. I honestly prefer European karaoke where you sing in front of strangers (not that I would ever sing…) but I love to watch my friends and husband sing 🙂 thanks for sharing! Aw how fun! We love Japan so much! One thing we didn’t do is Karaoke in Japan and I wish we did. Next time for sure. Thanks for sharing! Karaoke is so much fun. Heard about “Piss Alley” for the first time. Seems to be pretty interesting. Would love to visit this particular place. Thanks fro the great article. I’ve heard a lot about the karaoke in the Asian countries. It turns out that it is not that famous only in Japan but also in South Korea. It is kinda nice to have these private rooms with own stage to enjoy with your company of friends. Especially if you are a first timer you may not be comfortable to go in front of a huge bar full of people like it happens all over Europe. Will keep this article in mind and definitely go to a karaoke if I end up in Tokyo any time soon. And seriously, they have a place named Piss Alley? How cool is that! Seriously, thanks for sharing this adventure! Don’t know about others but I must now visit Piss Alley. Will be good to get drunk and then relieve oneself while listening to some J Pop. However, the setting also reminds me of Kill Bill! Sounds like you had a wonderful time! This is awfully alot like karaoke in Korea so I can totally relate. Piss Alley sounds funny too. I wonder if thats another name for Golden Gai? That area is supposed to be full of small bars too. Sounds like you had a very interesting experience. Piss Alley seems cool; the name is a serious buzz kill but it looks like place worth checking out. And yes please to mojitos! Karaoke is a very enjoyable experience. It is an experience where you need to let your hair down and let the inhibitions fly as you lend voice to your singing ambitions. I never knew that Tokyo had such a strong Karaoke culture. Great article. Karaoke is definitely one of the things I miss most about Japan. There’s just nothing quite like having a bender with a great group of friends and sharing drinks and laughs in the comforts of the Karaoke room. The Japanese certainly know how to have fun and drink! It seems like you guys had a blast there! Fantastic! My sis in law and I are hoping to visit Japan in a few months and I sent her your post to show her what has to be our plan for at least one night. Haha loved it.